The Passing Of A Queen. Shining Morn (With Rick Wakeman). A brand new studio album from one of the most accomplished acoustic guitarist this country has produced. 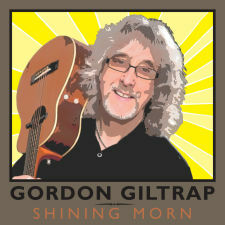 GORDON GILTRAP has a career stretching back to the late 60's and recently there has been a resurgence of interest in his music with much of his catalogue re issued. Gordon's work leans more to classical than rock. He is joined on the final track by old friend and long time collaborator Rick Wakeman and is touring extensively in the UK through out MAY/JUNE 2010 to promote this album. The accompanying booklet gives background details of each track including the tunings used for each piece along with photos of the other artists involved in the recording, Rick Wakeman, Andrew Bernardi, Hilary Ashe-Roy, Ian Carnegie and Karen Tweed. It is quite amazing what can be achieved by a man with a guitar and the soul of a painter. Gordon Giltrap has been around since the late sixties and his ability at playing the guitar has never been questioned but his heyday may have passed and he is now able to enjoy creating beautiful music, redolent of the British folk world, without the pressures of the commercial world and the result is this – I honestly cannot imagine anyone else more capable of describing the simple pleasures of a ‘Lazy Sunday’ without a single word or physical image. On track after track of this CD you listen to his playing and then you look at the title and somehow the sound and the title are a perfect match. ‘Simply Margaret’ is a case in point as the music puts in the mind a lady of a certain age, pottering about the house and bathed in natural sunlight, the simply picked guitar and the gentle flute and the easy strings all plucking from the listener’s mind the image that is so clearly described in the title. Two minutes and 27 seconds capturing a classic image. ‘Joy Ride’ sets me in mind of careening down a Somerset lane on a bicycle, ‘Passing of A Queen’ has sombre tones and draws out the emotions felt over the loss of a matriarch. All of these images spring from the mind of the listener and one of the greatest strengths of a writer/player like Giltrap is that he simply gives you a canvass to display your own visions and pictures. Every number here is a small joy of its own world and every one can exist in splendid isolation from the others but when they are put together like this the result is a magical ride through the mind. Background magazine (a Dutch review website) posted the following. Enjoy! Many people rave about guitarists like Steve Hackett, Steve Howe and Anthony Phillips, but I think Gordon Giltrap is one of the most underrated British guitar players around. His technique on the acoustic guitar is quite unique and is probably of an even higher caliber as these aforementioned musicians together. During the seventies Giltrap stood in the spotlights of people who loved progressive rock music. I considered albums as Visionary (1976), Perilous Journey (1977), Fear Of The Dark (1978) and Peacock Party (1979) to be musical highlights on which he displayed his talents on both the electric and the acoustic guitar. The mostly instrumental tracks also contained some very tasteful keyboard work that was a treat for my ears. His music never got boring and the instrumental piece Heartsong from Perilous Journey even gave him a hit single in the U.K. However, owing to the rise of punk and new wave, many artists from that era fell into oblivion. However, in 2006 I heard a sign of life from Gordon Giltrap. Together with several musical friends, including Rick Wakeman, he recorded the live CD/DVD Gordon Giltrap & Friends At The Symphony Hall Birmingham. In 2009, this live album resulted in From Brush & Stone, a duo-album with Wakeman on which you can experience how great a guitarist Giltrap is. Shining Morn is a brand new album that confirms anew why he’s an underrated musician. The 24 instrumental tracks show a real master on the electric and acoustic guitar. In the booklet it’s said that he used ten different guitars. Furthermore, of all performed songs a detailed story has been written by Mr. Giltrap himself. The music on Shining Morn is very interesting even if the pieces are mellow and slow. Thanks to the help of his musical friends he succeeds in keeping you focused on the music. The contribution of musicians on flute and violin lifts the music to an even higher level. Especially, the songs that contain flute playing made me think of the acoustic albums of Steve Hackett recorded with his brother John Hackett. Good examples are Simply Margaret and Joy Ride. On the final track, Giltrap plays together with Rick Wakeman who performs on the additional and extended version of the title track some acoustic piano. For people familiar with Giltrap’s older material it’s nice to know that he rearranged an old piece from his Peacock Party-album. He played Dodo’s Dream for years during live performances, so a new version of this piece is a perfect vehicle for trying some new devices like a Boss loop station and a Boss ME50 guitar effect device. Giltrap stated that he used no synthesizers on this track, but on some tracks he used a guitar synthesizer to get a richer sound. I found Shining Morn a very relaxing album which you should play to forget all about your daily stress. Just sit down on the couch with your partner, light some candles, enjoy a fine glass of wine and let the music do the rest. What else do we need…! All tracks recorded at Elversound Studios. Mixed and mastered by Paul White. Click the icons below to read more reviews from Maverick Magazine,Classic Rock magazine, Classic Rock presents Prog magazine, Guitarist magazine, R2 magazine and Guitar and Bass magazine.